Dunbar and Boardman: What was our project in Stephen’s Green Shopping Centre, Dublin City? On the 8th November in 1988 Stephen’s Green Shopping Centre was opened. It is one of the first large shopping centres to be opened in Dublin City and is managed by Jones Lang LaSalle . The shopping centre is located in the heart of the city between the Gaiety Theatre to the North and St Stephen’s Green to the East. 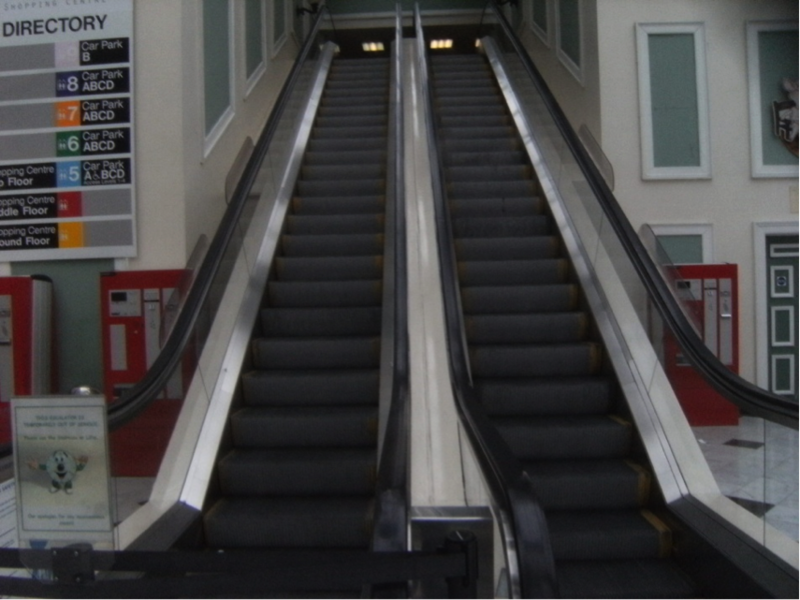 Dunbar and Boardman were commissioned to replace Kone escalators that had been installed in the 1980s. The biggest project challenge we faced was the logistical issues and there were many. First of all The Luas tramline and tiny one-way streets meant that removal of the old escalators and then delivery and installation of 2 new escalators at 5.88m rise was far from straightforward. Secondly the escalators were located on the top floor of a five storey functioning shopping centre. We had to either go through the glass roof overhead or down five floors of car park. The existing Kone escalators were one of the few remaining examples manufactured in their French factory in the late 1980s. Since the time of their installation light-weight materials and space saving solutions have become commonplace. Dunbar and Boardman were commissioned to seek competitive tenders for a major modernisation or complete replacement. The installation in February 2015 was the culmination of 18 months of planning and consultation to ensure that we reached the most cost effective solution for the client and least disruptive site works for the public. We chose the car park ramps as a route for removal and replacement. The clear height on the car park ramps is only 2.05m. The removal was undertaken over 2 nights, with the units being split into 4 sections to ensure the correct clearance. They were taken down through the car park using the ramps in four sections, one at a time. The 2 new Kone Travel Master escalators were delivered on the week beginning 9th February 2015, each in 4 sections, over 2 nights on 40 foot trucks. They were unloaded and brought up the car park ramps and then raised into position and reassembled. The team on site were Mulder Montage who undertook the removal and installation work, for Kone. 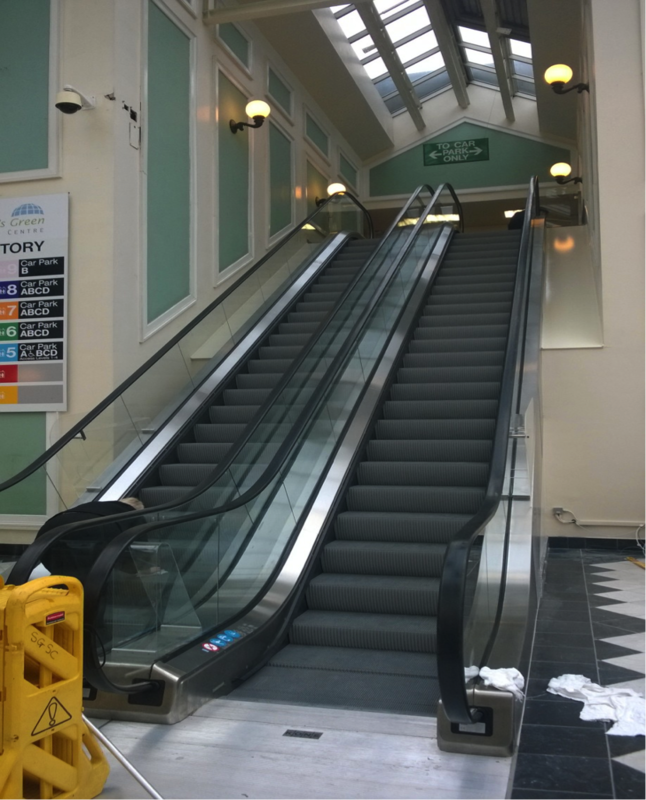 Light Speed technology has been specified on the escalators making them safer, these were the first escalators in Ireland with this feature. The new escalators included variable frequency drive systems which will provide a significant saving to the client in terms of power consumption. The whole programme from removal to testing took ~7 weeks, with little inconvenience to the Centre or members of the public. The installation was a success and the new Kone escalators have improved the vertical transportation capabilities of the Shopping Centre in terms of volumes of passengers, passenger safety and energy efficiency. Dunbar and Boardman is the lift, escalator and access equipment consultancy. Are you currently planning a project that will involve vertical transportation? We would be happy to discuss with you. Give us a call on T +44 (0)20 7739 5093 or send us an email via peterboardman@dunbarboardman.com to start the conversation. We look forward to hearing from you.